A West End Gem! As you enter this 2 bedroom PENTHOUSE suite, you'll notice a very bright and spacious living/dining area with a functional wood burning fireplace. The suite boasts a custom designed kitchen with granite countertop, built-inoven & microwave. 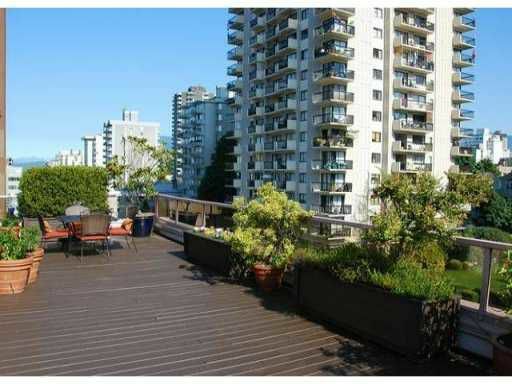 A west facing 116 sq ft patio gives you peak-a-boo view of English Bay. As you walk out the back patio doors, you'll be amazed to discover an additional 950 sq ft private, wrap around deck. With a short walk to West End beaches & restaurants; great views & a great space to entertain, you'll be living the good life with this rarely available suite. INCLUDES: insuite laundry, 1 parking, 1 storage. Pets welcome. Open Feb 11 & 12, 2-4.